iPhone 5s, iPhone 6, and iPhone 6 Plus users who own a St George account can now use Apple’s Touch ID fingerprint sensor to log into the app rather than typing account details each time. Support for the Android-based Samsung Galaxy S5 is expected to go live “in the coming months”. 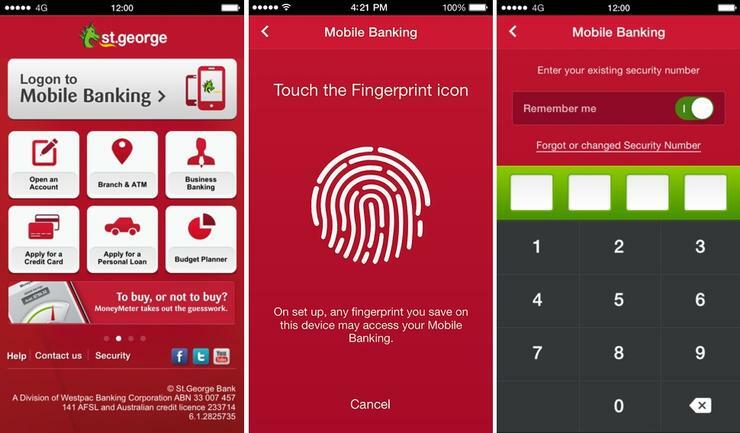 Wespac Bank, St George's parent, will enable fingerprint sign on within its own app "in the not too distant future," a spokesperson has confirmed to ARN. Setting up Touch ID login is a simple process. First, download the latest version of the St George app (it is free) from the Apple App Store or update the existing version. Then tap the ‘Logon to Mobile Banking’ icon at the top of the home page and type bank account details, security number, and password. Before confirming the login, turn on the ‘Remember Me’ feature; once this is done, the option of using Touch ID will become available. The app automatically recognises an existing Touch ID fingerprint. iPhone users who have not registered one will be required to do so before being able to utilise St George’s biometric login option. Users who have previously used the 'Remember Me' option to login with a single password must first deselect the option, clear login details, and repeat the full login process (as detailed above).